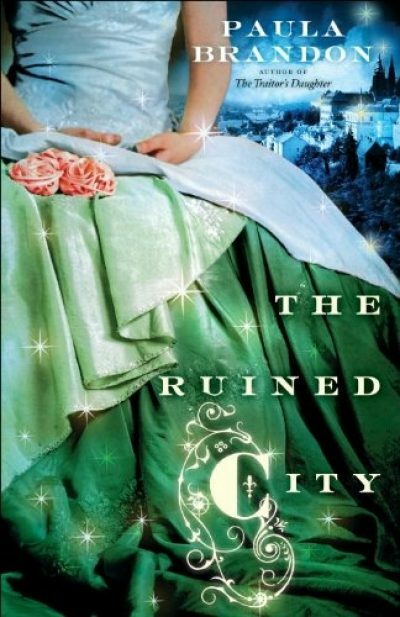 2012’s The Ruined City is the middle volume of Paula Volsky’s (or as the cover would have it, Paula Brandon’s) Veiled Isles trilogy. It begins on a somewhat hopeful note: not only has Jianna escaped from Ironheart, but the adepts of the Isles finally seem to be doing something about an existential threat that makes all lesser conflicts, political, military or domestic, entirely beside the point. This is the middle volume of the trilogy, so it’s not going to be that simple. Jianna may have escaped from the malevolent matriarch Dowager Magnifica Yvenza (who planned to reclaim the family estate by forcing Jainna to marry Yvenza’s brutish son Onartino), but … Jianna made it only as far as the local freedom-fighter stronghold. Freedom-fighters who are allied to Yvenza. If any of the rebels there realized that the woman they know as Noro Penzia, assistant to doctor Falaste Rione, was in fact Jianna Belandor, daughter of the hated traitor Aureste Belandor, she and the doctor would be doomed. The best they could get would be a quick death. A quiet exit and hasty journey back to the Taerleezi-occupied city of Vitrisi seem prudent. Meanwhile, aware that a mystical calamity is bearing down on the Isles, a group of adepts and their supporters have decided to put aside their differences long enough to carry out a ritual they believe will prevent the catastrophe. Some of those differences are fairly profound. For example, Vinz Corvestri was framed for crimes against the Taerleezi. While Vinz isn’t quite sure who framed him, he is aware of and bitterly resents the role Aureste played in freeing him. He is also angry that Aureste has become suspiciously close to Vinz’s wife, Sonnetia. Of course, since Aureste isn’t the family adept—his brother Innesq is—Aureste isn’t necessary to the ritual. He has served his purpose by gathering the adepts; if he were somehow to be eliminated … well, that wouldn’t be so bad, would it? Jianna and the doctor (whom she is finding increasingly attractive) arrive in Vitrisi to find the city under even more stringent martial law. Much of her family mansion lies in ruins. Her doting father is absent (dealing with the whole end-of-the world thing), leaving the estate in the hands of his milquetoast brother Nalio. Nalio is quite enjoying his first taste of power and revels in the chance fate has handed him. He schemes to force Jianna into yet another unwanted marriage . Balked of the refuge she had expected, she flees to rejoin Falaste. Alas, Falaste has problems of his own. Chief among them is the fact that his sister Celisse was a lot more adept at assassinating the Taerleezi governor than she was at escaping his outraged guards. Although in her defense, she did manage to stay free long enough to lead them to Falaste…. When I write reviews of expansive series, series with plots and subplots, it is hard to decide what to leave out. In order to save space and keep the review short and tidy, I’ve had to leave out the looming slave-race uprising (although I bet it will play a central role in the third book, which I have not read), and the magical automaton (an entity that could give Kuttner’s eponymous robot in “The Proud Robot” a run for its money in the smugness department) … but if I talk about all that, it won’t be left out. Once again I note that I enjoyed a Paula Volsky novel; once again, I lament that her novel was thoroughly mismarketed. While Spectra was upfront about this being a trilogy, I don’t immediately see the name of the trilogy anywhere on this book. The series is a competent secondary-world fantasy, but the cover art suggests that this is a romance. Because Spectra forced a pen-name on the author, none of her established audience would have known to buy this. Any romance fans who bought the book on the strength of the cover would probably have found the romantic elements in the book too small a part of the plot to satisfy them. I think that there was a readership for this trilogy, and Spectra’s choices prevented the novel from reaching it. The problem with middle volumes in trilogies (at least of the sort wherein all three books form one long narrative, not three related episodes) is that none of the grand issues of the plot can be resolved. Too many middle volumes disappoint; their only function is to keep the series a trilogy rather than a duology (which might mean smaller sales and higher printing costs). I am glad to say that Volsky pretty much avoids this trap. There is a hint of middle-volume sag in the plots centering on Yvenza and her son Onartino, but for the most part the author provides just enough closure to make the book a satisfying read. Volsky’s solution to sag is to reach for larger rocks to huck (2) at her protagonists. There may be grand solutions coming in book three; I hope so. By the end of book two, pretty much every sympathetic character who is still alive is worse off than they were at the end of book one. The unsympathetic ones are not exactly doing well, either; the path to eventual success (3) is entirely unclear. This book would have been catnip to the series’ readers if only the book had reached the right readers. If only. 1: As I recall, Jianna is already legally (if not willingly) married to Onartino. 2: A note from my editor: “I think huck might be regional dialect? I have never seen this word.” As with the word “cribhouse”, I have no idea where I picked this up but am proud to help encourage the use of a fine verb. 3: Also, what constitutes success isn’t obvious at this point. For some characters, a swift death could be counted as success, given that the Taerleezi are quite keen on slow, painful executions.